Pink Peony Tablescape And Birthday Party! The peonies are in full bloom at StoneGable. Their big moppy heads are bent close to the ground, wet with last nights rain. Their glorious perfummy aroma wafting up onto the back porch. I have been planning this table for months. 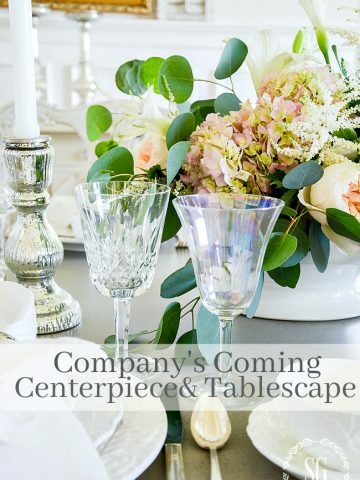 Finding the few elements to go on the table in thrift shops, flea markets and antique shops. Simple, white and pink. Lace, starched linens and touches of silver. Letting the beauty of these magnificent flowers be the center of attention. I have been anxiously anticipating the arrival of the pale petal pink peonies. The very best part about creating this table is that the blooming of the peonies also coincide with Pink Saturday’s second birthday! A meme hosted by Beverly at How Sweet The Sound, Pink Saturday is all about pink attitude! So this tablescape becomes a birthday celebration! Just for you and Pink Saturday. This small table on my porch is set for two. Silver utility serving trays hold a stack of white and pink dishes. Pretty rose-like bowls (HomeGoods) top Limoges “Feme” salad/dessert plates. The limoges plates are the fruit of a very productive shopping day at a rediscovered antique shop in Lancaster Pa. Rev Chi’s Antiques proved to be a goldmine! The knowledgeable and amiable owner was so helpful. And I was able to find some lovely pieces at very reasonable prices! The delicate rose design on the porcelain plates were created using a technique called “combination”. The outline is a transfer and then they are hand tinted. I swept them up to give them a loving home! 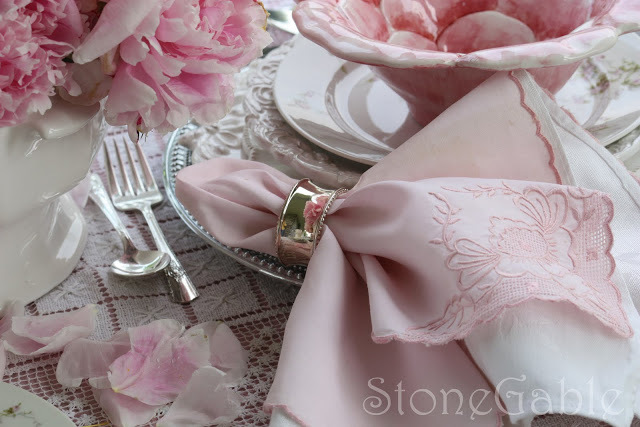 White damask and vintage pink napkins are gathered together in a silver napkin ring. 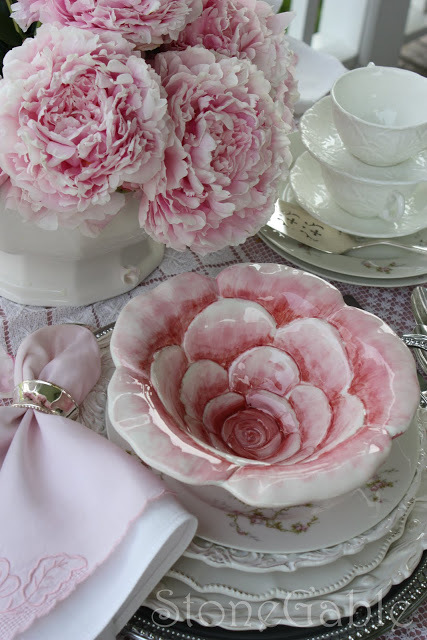 I love the pink ruffle of the peonies, the rose bowl and the scallop of the napkins..pink perfection! The table linens were borrowed from my mother. A rose colored tablecloth peeks out from underneath my great grandmothers heavy lace beauty. The silverplate flatware is a recent purchase from Rev Chi’s Antiques. It was manufactured by Harmony House and dated 1944. It has a monogrammed “D” on each piece. I am wild about monogrammed silver… even if it is not my initials. If you are interested in silver and silverware care you might want to see my post on collecting and care of silver. Click HERE for post. The cake server is a particularly lovely piece. Cups, saucers and dessert plates wait for those yummy strawberry birthday cupcakes! These stately salt and pepper shakers were rescued from a flea market for $2.00. I shined them up and they have a new life now! The real center of attention are these fabulous pink peonies! Full and lush and so beautiful. A soup tureen becomes a centerpiece for these captivating blooms. The table is ready for a little pink birthday party! Happy Birthday, Pink Saturday! Beverly you have brought so much fun, creativity and joy to many bloggers, followers and friends! Here’s to many more! I am participating in Pink Saturday’s Second Birthday Celebration! Beverly, thank you so much for all of your hard work! Please go and visit Beverly and and wish her a very happy birthday! Click HERE for a pink visit! I love your table settings! 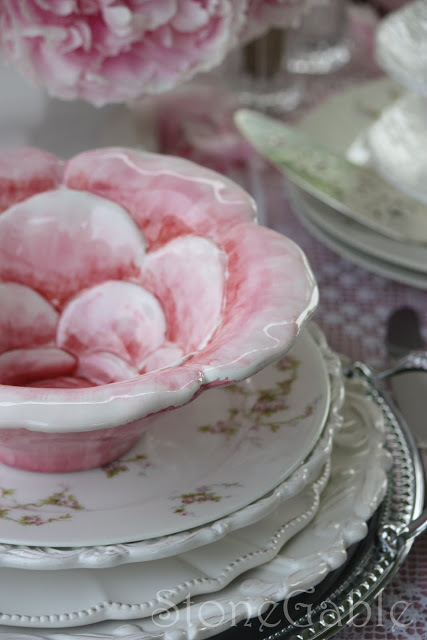 But I just wish you’d list where to buy some of the more “unique” beautiful items, such as the rose shaped bowls featured here, & the artichoke candle holders on your artichoke table setting page. All gorgeous, but unobtainable? I hope my tables inspire you and give you ideas of your own Connie. Some of the items on my tables are very old. Both the rose shaped dishes and artichoke candleholders are from HomeGoods. Thank you for the response & information, Yvonne. I’m very inspired by your tables, to the point where I’d like to re-create what I admire most, but with my own personal twist to them. When I see items that are particularly unique & beautiful, I try to add them to my own collection. Which is why I asked about the rose bowl & artichokes. I ‘ve never shopped at Home Goods but since you seem to have found so many lovely things there, I’ll start checking it out. Thanks again for the response & for all your inspirational blogs! Luv Luv ALL your beautiful tablescapes. 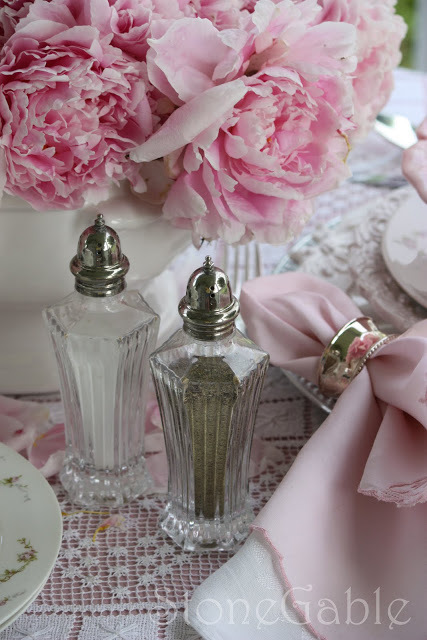 My FAV is the pink peonie tablescape. The black and white is stunning. Thank You for MORE great ideas. I luv to set the two ! !… romantic. Beautiful photos…and my favorite flowers! Your blog is beautiful! It touches that part of me that goes neglected because life is so demanding and hectic. It is wonderful to find a place to visit that is peaceful and blissful. Visiting your blog is like opening up my new Victoria Magazine…so gorgeous and well done. I enjoy every minute that I spend here. Thank you for sharing your expertise in so many areas of life. WOW- Hello Beauty- you did an amzing job-when i planned my daughters cupcake tea party- your tables were what I invisioned mine looking like- but didnt happen that way- ran out of time.. LOVE THem , If i ever do another i will revert back to yours for inspiration.. 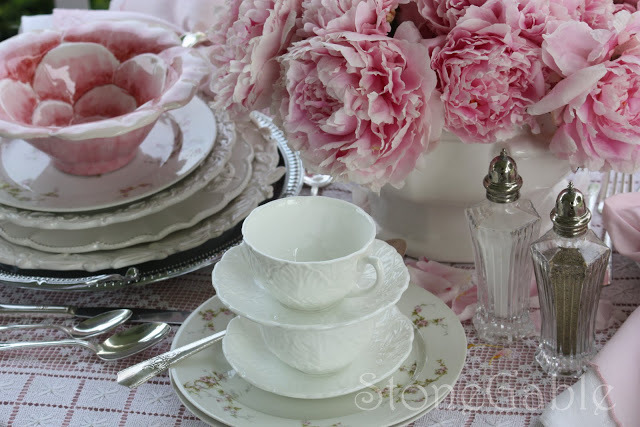 I am in total love with this tablescape as those pink peonies are divine! And the gorgeous layering of your plates….you are a style maven, a design diva, but with a sweetheart Christian soul/being that exudes light and love…it comes through in all your aesthetic endeavors! beautiful table. 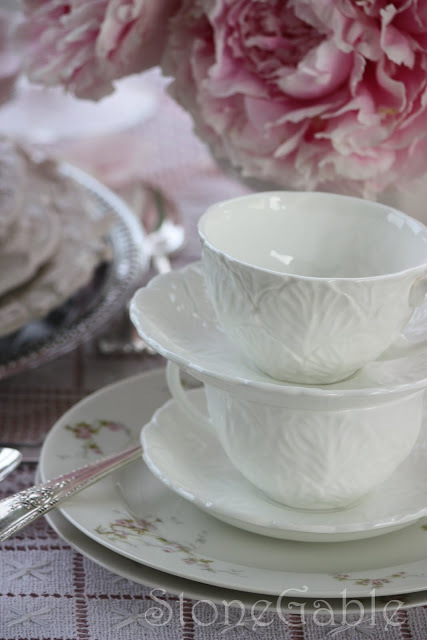 i love the countryware–that was my first china purchase and it will always be a favorite. 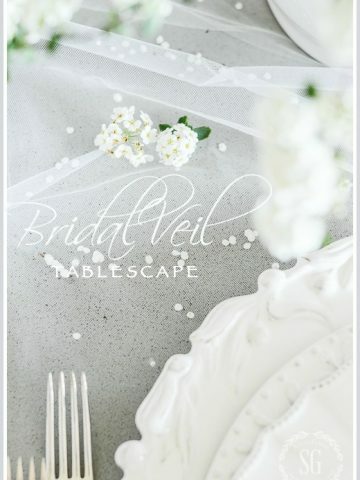 I am a new blogger and love your tablescape! Peonies are my favorite along with the color pink! Your table is just beautiful!!!! These pink peonies are my favorite! Each year, I can’t wait to buy some from the farmer’s market in May! I LOVE the table display! Thank you for so many great ideas! AND, thank you for stopping by my site again! This is STUNNING! And those peonies are TO DIE FOR!! Stunning peonies and lovely party! Absolutely lovely! Thanks for sharing and have a great day! Wow, your table is exquisite! I love those flowers. I need to grow some. We live in the mountains and get snow…I wonder if they could handle the winter months…hmm. Your table is so beautiful it just takes ones breath away! Love visiting your blog and seeing what beautiful things you are up to! Oh, those flowers are just GORGEOUS! You did such a beautiful job paying tribute to them with this lovely pink and white tablescape. It takes a while to get to the bottom of 76 comments to leave mine but I just HAD to say how GORGEOUS your pink & white ‘scape is! The peonies are lovely and you have found all the perfect accessories to play them up. Love those pink flower bowls! Love your blog, your ideas, your photography and your DISHES! This is absolutely breath taking! Beautiful! Oh how pretty your pinkness is! 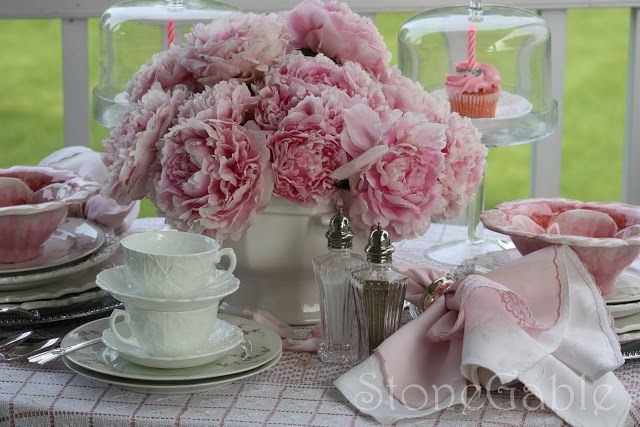 My favorite color — those peonies are amazing and your pinks match perfectly. I am in awe! Those pink peonies are beautiful! You are one talented lady..your table is gorgeous and the flowers are lovely! That is perfection, absolute perfection! Probably the prettiest table ever! 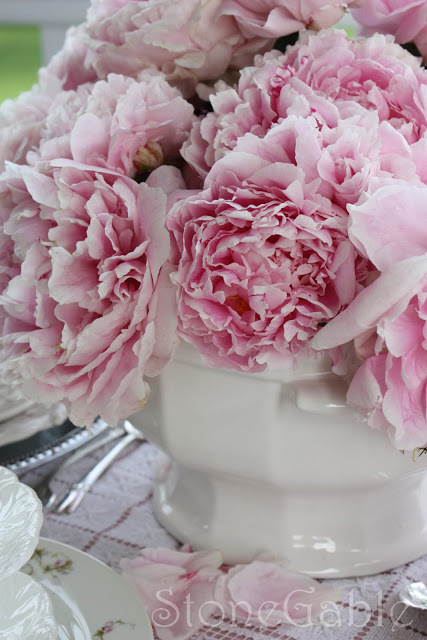 I love your gorgeous peonies and your table is stunning! Oh my goodness, how gorgeous!! It looks like a table out of Southern Living Magazine!! You have such a talent. Looking forward to seeing more! 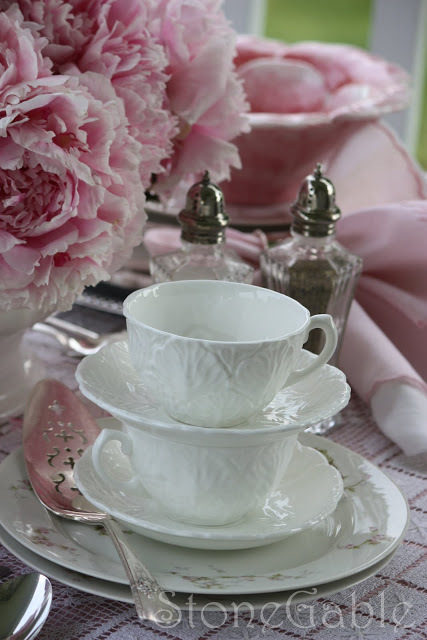 Yvonne~ (sigh)pink peonies are the flowers I wait with great anticipation ti bloom each summer. We receive an over abundance of rain in the PNW and this can ruin my crop of peonies that bloom during a rainfall. I’ve just learned you can cut them in bud form and they will keep up to 6 months in your refrigerator and will come to a full bloom in a vase with water. This news was music to my ears. I love them soo much I included them as the focal point of my blog banner. Happy Pink Saturday, Yvonne. We’ve been pinking together for going on a year now. Thank you for everything you do to make Pink Saturday special. I am so glad we met. Your blog is always an inspiration. Thank you for the exquisite beauty and perfection of this birthday setting. It could not be more perfect. And, thank you for your kind words. Pretty, Pretty, Pretty! I adore pink. Everything you do looks like it belongs in a magazine. Just gorgeous. Absolutely beautiful. 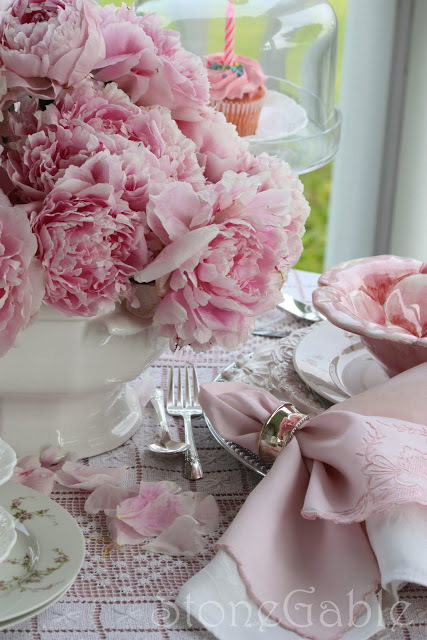 Pink is my favorite color and peonies are a favorite flower, second only to hydrangeas. My mother has gorgeous peonies at her house that she cares for lovingly. I must confess that I snagged and borrowed your gorgeous profusion of peonies picture and have it now as my background on my laptop at work. They make me smile and remind me beautiful people, like my mom and now you. I am a new follower and seeing your posts brightens my day. Thank you for sharing your thoughts, your eye for decorating, your recipes, and your charmed life. Lovely table.. of course those words don’t even begin to cover how beautiful everything is. I can’t wait until I have enough peonies to actually cut some..
P.S. Love your Memorial Day tribute also. So beautiful! 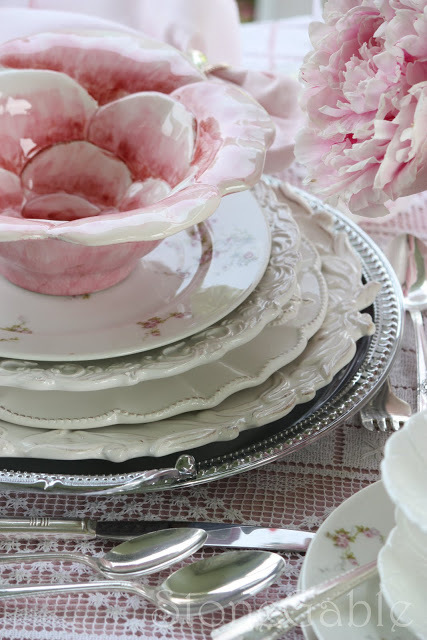 Loving the peonies and the rose bowls…so pretty! Just beautiful! The table is gorgeous, and the flowers are amazing..and I thought I commented on this the other day! Oh boy! Yvonne…this is MAGNIFICENT! Absolutely breathtakingingly BEAUTIFUL!!! Every detail! Thank you for creating such an inspiring table…I LOVE it! I hope you were able to get to Luckett’s…I was there last Saturday for the Outdoor Market…FUN! I have such pink fever that I LOVE this!! It might be even prettier than the lilac table, although that lilac one is pretty hard to beat! Aren’t peonies simply beautiful? I honestly believe that they are God’s most creative flower. They are like two flowers in one. Oh Yvonne, your peonies are gorgeous. Mine did not fair well after the rain. 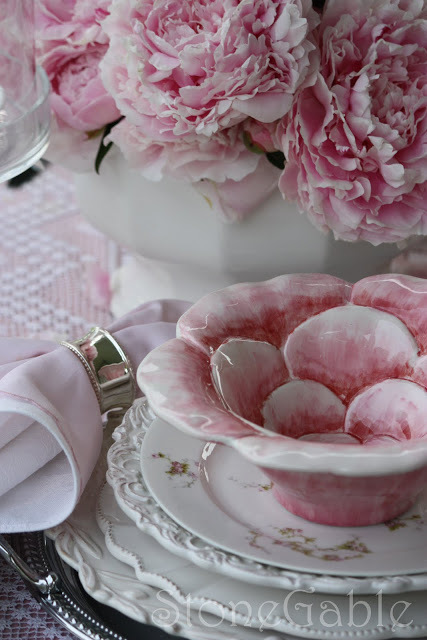 I love your tablescape with the mix of soft pinks and whites. I have quite the collection of Limoges, but it just hasn’t found it’s way to a post, maybe soon. You whole table is just lush; I love it. So practically perfect. And the peonies are to die for! Yvonne, this is absolutely breathtaking. Unforgettable. I am sure Beverly is honored. The thought and effort is so touching and your artistry and attention to details are always one of my favorite things. What’s that expression, God is in the details? 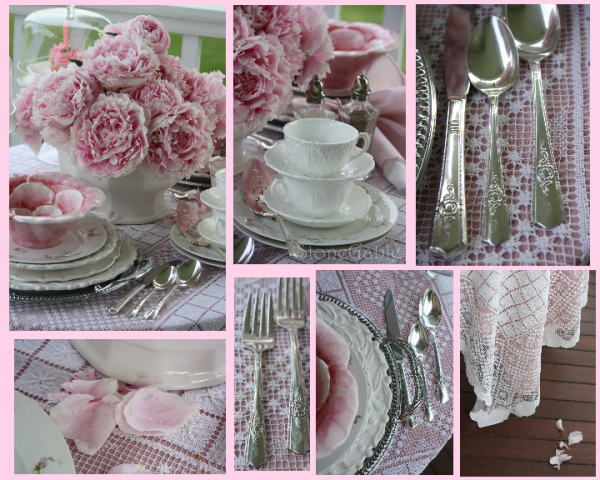 What a lovely tablescape in honor of Pink Saturday!! Happpy PS! what a lovely post! beautiful setting and the pink bowl is just gorgeous!.. love lov love them all!. thanks for sharing. have a good weekend! Sooooo pretty! I LOVE peonies! Very, very pretty! What a refreshing Spring post! A sweet hello from Frog Hollow Farm! What an absolutely beautful post Yvonne, I just couldn’t get enough. Every single photo was breathtaking. I’m working on a pink berry-themed tablesetting! It’s so much fun looking for things on clearance and in antique stores that would fit with my table design. Ciao, bella! Lovely post! Hope you had a great Pink Saturday! Your photos were wonderful and the flowers amazing. I love everything about this beautiful table! 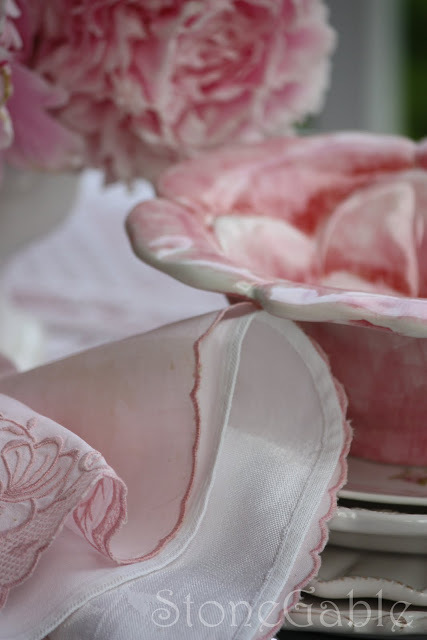 Dreamy dishes and linens and the most gorgeous preciously pink peonies! Yvonne, your table setting is gorgeous. 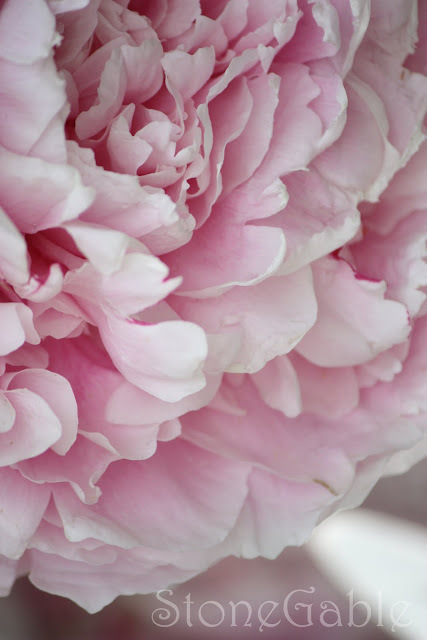 I love peonies – they are my favorite flowers. I never tire of seeing them. We have a bush at home that has peonies in that same shade of pink. Aren’t peonies just the loveliest?Their scent is intoxicating, and your pictures and post were just as wonderful!HPS! Pink peonies are hands down the showiest flowers in the garden. They just scream..”look at me!”. 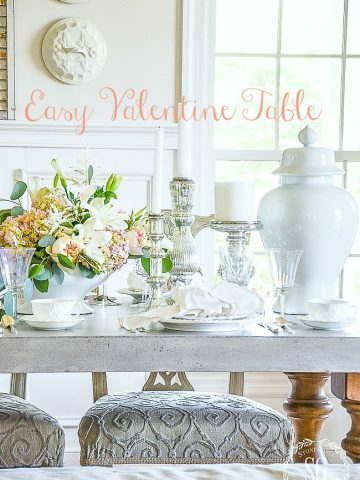 From one “dish” girl to another, that table setting is stunning…just gorgeous. Hope you are having a wonderful weekend. 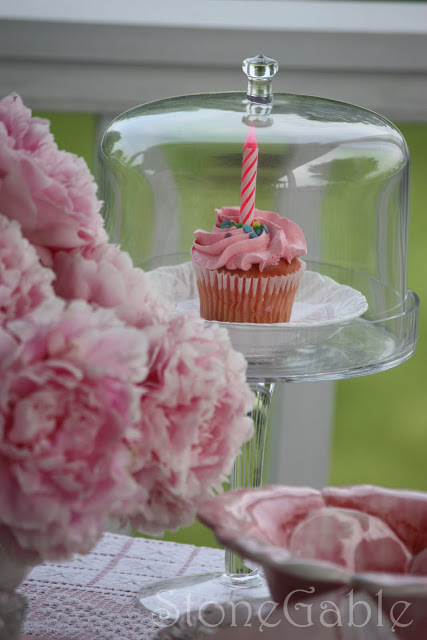 pink peonies AND cupcakes – it doesn’t get an better than that! 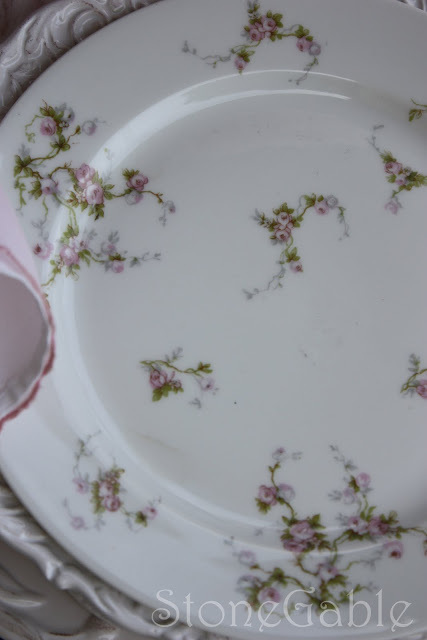 Hello Friend~ ~You know of my weakness for pink flowered plates and your Limoges is lovely! The S&P are so sweet too. Have a fun weekend with your family and I’ll see you in June. Soooooo…….. lovely! I would so love to sit at one of parties. I would never want to leave. Thank you for the beauty that you share with us. OK–now this tablescape is my favorite 🙂 I absolutely love it Yvonne! What loveliness you bring to the world! I am always better and happier after having visited here! How uplifting this post is, Yvonne. You are the JOY of HIS heart. When I heard all the thunder rumbling in the distance yesterday, my first thought was to pick some of my peonies before they were drenched by the storms. So I go two bouquets-one for the kitchen and a second for one of the guest bedrooms. Mine are spectacular this year. In fact, all my flowers are. The snowy winter caused some very showy flowers this spring. Love your table. I could reach right through the screen and eat that pink cupcake! How utterly delicious!! Pure Pink Perfection, Yvonne! I know you had to be in heaven, shopping that antique store. What lovely treasures you found, too. You’re fortunate to have your Mom still alive so you can borrow from her. Yesterday was the anniversary of my mother’s passing. Its always a bittersweet day. I gave you a shout out on my blog today where I posted about making shrimp scampi. Thanks for pointing me towards Ina’s recipe. It was yummolicious! Thanks for stopping by to visit me at My Cozy Corner. I wanted to say that the branch from the Iceberg rose bush just volunteered. It rooted it self from one of the shoots off the twig that I didn’t pick up in the fall pruning. Thanks for asking. Oh! All looks so beautiful, is a fantastic table! Yvonne, you made a breathtaking pretty pink peony table. And so are to photos, too. All looks so neat and fresh and I love all the details. The lace tablecloth of your grandmother is really a treasury of needlework. Your tablescape is fabulous. And the peonies are beautiful. I’m not sure what they smell like but it must be heavenly. I hope you can find a minute to go to my blog. Look at the similarity between our dishes. I’m actually featuring them tonight. Yvonne, the pink peonies are spectacular. I can just imagine how wonderful your home and yard smell with the delightful fragrance from these beauties. Beautiful table and tribute for Pink Saturday’s 2nd Anniversary. You create the most amazing tables. Awe-inspiring! One of my favorite posts ever! Your table is true eye-candy. This is so pretty. It makes me feel all “girly” just looking at it. I told someone yesterday that I can’t keep the ants off my peonies to bring them inside. Everyone must know something I don’t. I love the way each layer compliments the next. Very nice. Absolutely stunning table scape. I love peonies. I have had them for years but just cant bring myself to cut them,lol. I have to get over that. I wish I had a Home Goods Store, you have so many beautiful things. Love the blog. Ah the peonies are stunning, one of my favorites. Your table is absolutely stunning! 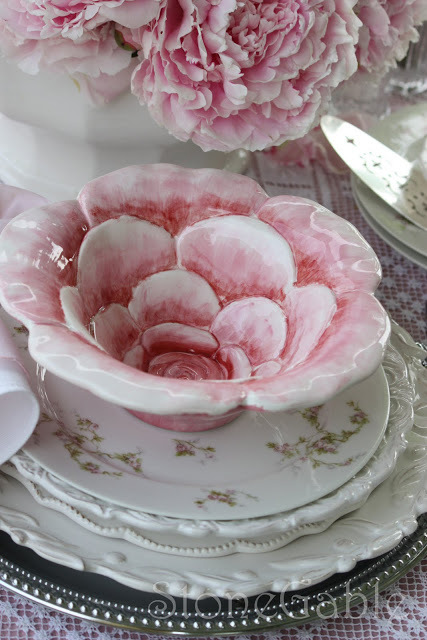 The flower bowls atop the delicate Limoges plates is so lovely. Did you say monogrammed silver? – Yvonne we must go shopping together, I don’t care if they’re my initials either. And starched linens along with a lacey top. Are you my long lost twin? Ha ha! Happy Memorial Day weekend. I may be an American transplant in France but I’ll never forget the day! what a STUNNING & DIVINE table. the pink is amazing & your flowers are a vision from heaven. this is by far better then ANY magazine images! and the best part of it all, i know you did it all with love of your gorgeous flowers, dishes, & visions of a pink table scape. do your guests just sit in awe of it all? thank you once again for a beautiful post. It’s just all so pretty in pink. Those are the most beautiful peonies I have ever seen! 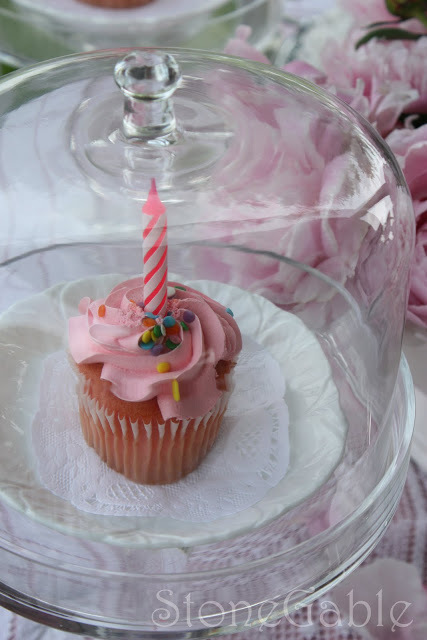 Enjoy a really delightful Pink Saturday Celebration! What a lovely table! Those peonies are to die for!! They have to be one of my all time favorite flowes..wish they bloomed from a longer season..don’t you? 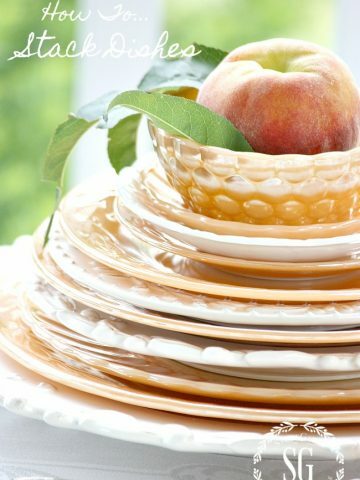 Your layered dishes are so gorgeous! Hope you have a blessed Memorial Day Weekend! Wow such gorgeous table scape! Thank you so much for sharing Yvonne. Hi Yvonne, The peonies are absolutely gorgeous! Thank you for sharing your beautiful table setting with us. 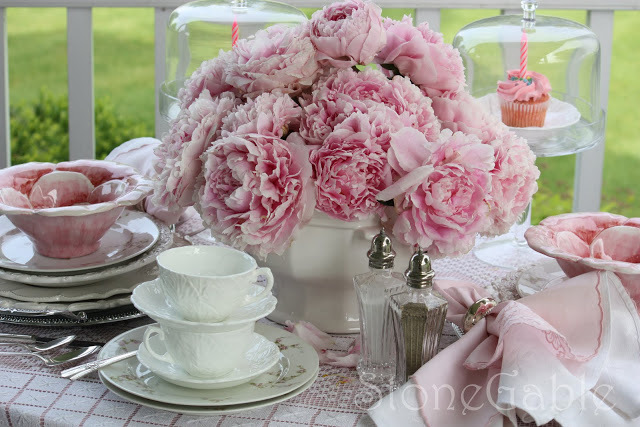 Yvonne, what a beautiful table and peonies…there is nothing that smells better than a bouquet of peonies. I just wish their season lasted a little longer, it is a long time until they blossom next year! Your peonies are stunning! And so beautiful with the white. This is one of the prettiest tables I’ve seen. Oh Yvonne – Pink is my FAVORITE, so this is exactly what I’d envision my ideal birthday celebration to be. Happy Birthday to Beverly’s Pink Saturday! I just stumbled upon your blog. My, you have a lot of pink loveliness on this post! Beautiful! Oh Yvonne- I SO miss my peony gardens from NY! I almost cried seeing this table- so lovely and brought back memories of that glorious fragrance and many lovely bouquets. Gorgeous table! Yvonne…my words have left me! 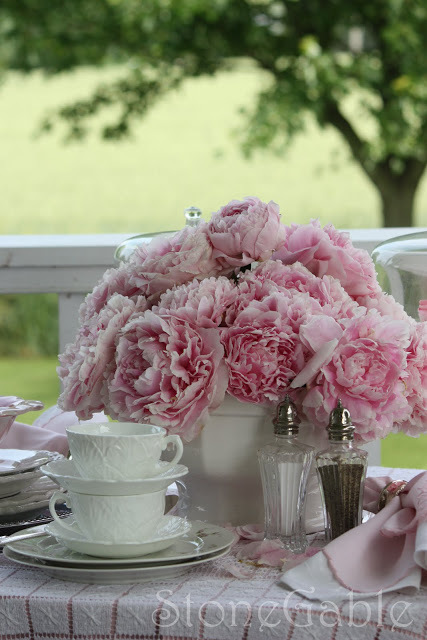 This table is beyond beautiful and so are your peonies! I can believe you have been planning this for months–pink perfection!! How nice of the gorgeous peonies to cooperate :). They are so gorgeous; I can almost smell them. I have never heard of the combination method (though I don’t know much about it) Thanks for teaching me and sharing this beyond elegant table!!! STUNNING!!! I am still trying to catch my breath…this is my ALL time favorite table EVER!!! 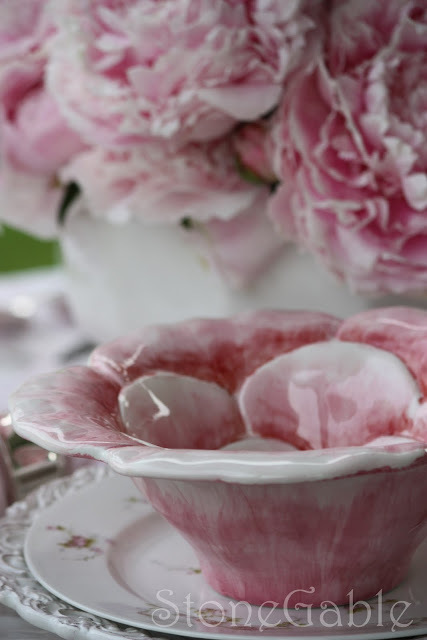 You had me with the pink peonies and then just grabbed my heart with the oh so gorgeous bowls. This is truly a work of art! 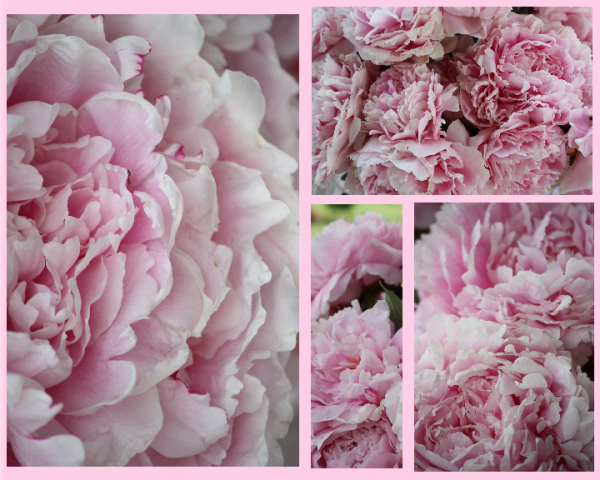 Did I mention I LOVE the peonies…I love the peonies;)! I give you permission to set the table for my birthday for the rest of my life;)! Beautiful Yvonne! My favorite is the tinted porcelain plate! I love PS, it’s so nice to read through it with a cup of coffee on Sat morning! An absolutely scrumptious post for Pink Saturday, Yvonne! 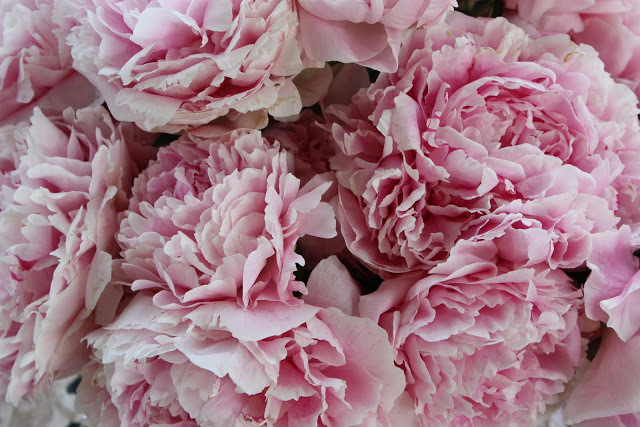 I adore peonies; especially pink ones and yours are perfect! Thanks for sharing all this beauty and hope you have a Happy Pink Saturday ~ Memorial Day weekend. Here I am, so very tired and still feeling the effects of getting too hot this afternoon while sanding and painting the front door. I really overdid things. I drug myself into the house, got me upstairs and into a cool shower, then plopped. Still feeling dizzy and my ears ringing. THEN, THEN!!! I see your blog! My favorite flower, the Peony, in all it’s glory on your table. Ahhhh…..what a beautiful table. Breath taking….thank you for making my day. Hi Beautiful blog. I’m so inspired when I look at your creations. Glorious!!! I am so excited when I see that you have a new post. The peonies are just stunning and your setting is perfect. Thank you so much for sharing this. You know I love the pink peony more than anything! What a lovely post and I am sure they look great in your garden too. I must shop Home Goods more-you find some pretty things there. Happy weekend and Have a PINK day! I love peonies. I am not sure if you saw my post for last week. I think you would enjoy it. Beautiful dishes and table.